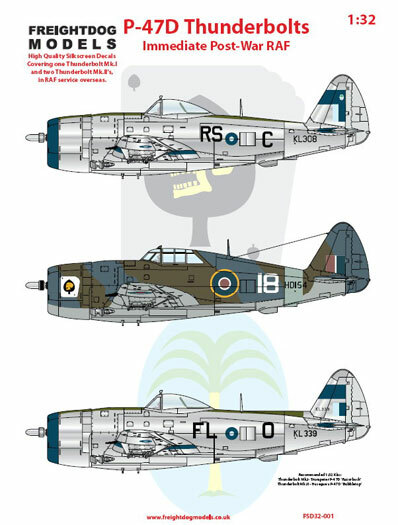 Freightdog Models has released a number of interesting decal sheets over the last year or so with an emphasis on post-war RAF and FAA subjects - an area rarely covered until now. 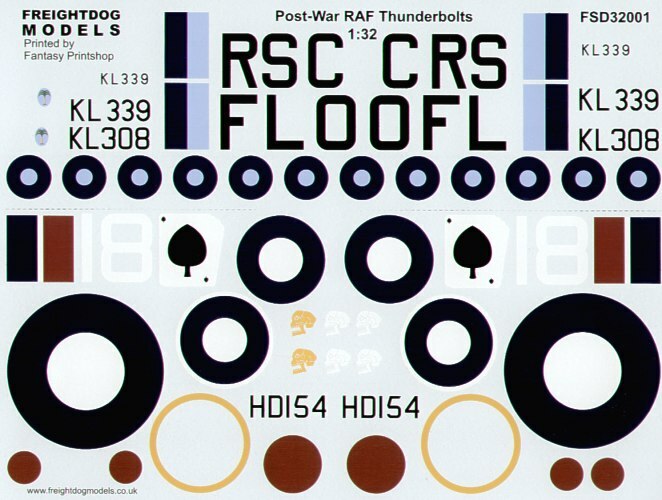 "P-47D Thunderbolts - Immediate Post-War RAF" represents Freightdog Models' first welcome foray into 1/32 scale, and provides markings for three P-47D Thunderbolts. One Razorback and two Bubbletops are covered. Thunderbolt Mk.II, RS-C of 30 Sqn based at Baigatachi, India in 1945. Overall natural metal with broad Roundel Blue ID Stripes and Olive Drab anti-glare panels fore and aft of the canopy. This aircraft features the small two-tone blue SEAC markings and a tiny palm tree emblem on the fin. Thunderbolt Mk.I, 18 of 73 OTU based at Fayid, Egypt in 1946. It is suggested that this aircraft is finished in US equivalent colours Olive Drab, Sea Grey and Light Grey. A large Ace emblem is supplied for the cowl, with an optional Skull in either white or yellow for the black section of the spade. Thunderbolt Mk.II, FL-O of 81 Sqn based at Java in 1946. Overall natural metal with Roundel Blue ID Stripes and Olive Drab anti-glare panels fore and aft of the canopy. This aircraft features the small two-tone blue SEAC markings. The aircraft is fitted with the small fin fillet. The decals are beautifully printed by Fantasy Printshop in the UK. Carrier film is thin and minimal at the borders, while colours are well saturated and in register. The instructions are supplied on a single folded A4 sheet. Each subject is covered in full-colour four view illustration, with model paint references (FS number, Humbrol, Xtracolour, Xtracrylix, Lifecolor and Model Master). Recommended kits are Hasegawa for the Bubbletops and Trumpeter for the Razorback. These are both great kits. Freightdog Models' 1/32 scale Thunderbolt decals will lend an air of individuality to your P-47D models, whether you prefer bare metal or camouflage.